The San Francisco Police Department's commander of investigations described statements Friday taken from four witnesses to the fatal police shooting of a homeless man Thursday in the city's Mission District. Cmdr. Greg McEachern said at least three witnesses described the man -- identified Friday by the city medical examiner's office as Luis Gongora, 45 -- as having a knife in his hand as he moved toward a group of officers. McEachern said more than 10 witnesses have provided statements to investigators, but he described only four of them. "These are the statements that we are providing today for some clarity on information that has been put out in the media in the last day or two," McEachern said. "We are providing information, statements from the witnesses, that may differ from some of the statements provided by the witnesses so far." "He saw the suspect sitting prior to the shooting, saw the suspect stand up and lunge at the officers. The witnesses heard shots, saw the suspect still had the knife in his hand after the shooting." "A second witness said that the suspect rose up with the knife in hand and ran toward the officers with the knife in his hand. The suspect was flailing his hands with the knife as he ran toward the officers. He saw the officers fire their pistols and then saw the suspect spin and fall to the ground with a knife still in his hand." "Witness three said that he saw the suspect running toward the officers with the knife in his hand. The knife was raised up as he ran toward the officers." "Witness four -- who says that he knows the suspect as Spanish speaking, but he’s also communicated with him in English -- saw the officers with the orange shotgun, which is our extended range impact weapon, deploy that, and then saw the officers shoot at the suspect shortly after, saw the suspect hit the ground, and then the witness saw the suspect’s knife appear on the sidewalk." McEachern said the two officers who fired would be interviewed by homicide investigators Friday. One had specialized training in de-escalation and responding to suspects in psychiatric crisis, according to a statement from the police officers union. KQED and other news outlets interviewed John Visor and Stephanie Grant yesterday -- two people who said they live in a tent next to the man who was shot. Visor said the man, who he knew as "Jose," carried a knife, but that it was stuck in his waistband and not in his hand when an SFPD sergeant shot at him. Others told reporters yesterday that the man went by "Jose Luis." McEachern indicated that the fourth statement described above was taken from Visor. Visor said Thursday that his friend's knife was never in his hand. He described him as a man "in his 20s" who often scrounged bottles and cans and liked to kick a soccer ball up and down Shotwell Street where they both lived in tents. He said both had moved there after the city cleared a larger encampment on Division Street on March 1. Gongora died at around 1 p.m. Thursday, according to a hospital spokesman. SFGate published surveillance video Friday that McEachern said shows officers approaching a suspect on Shotwell Street, but the shooting takes place just outside the video's frame. KQED's analysis of the video indicates four shots from a pump-action gun. 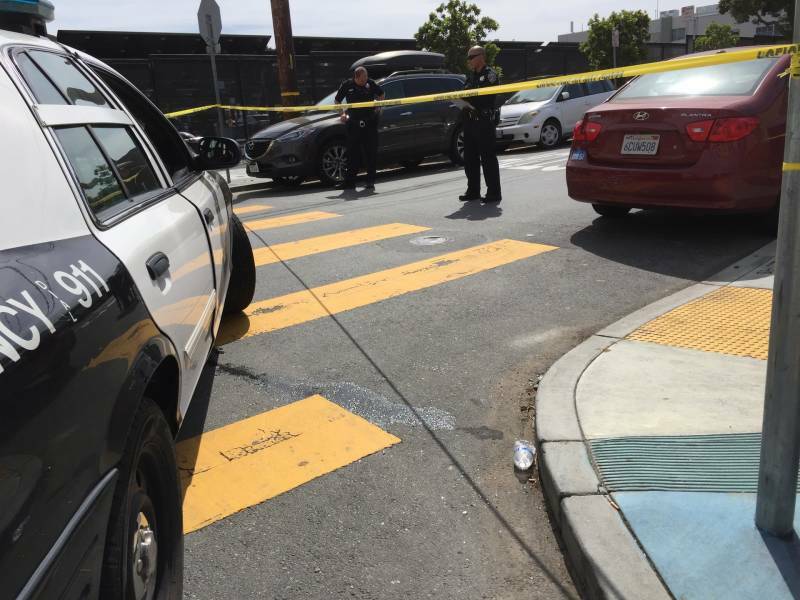 An SFPD spokesman confirmed Friday that officers use a shotgun to fire one type of less-lethal impact rounds the department uses, and Suhr said Thursday that four impact round casings were recovered from the scene. The fourth pump-action shot is followed immediately by approximately seven gunshots. The incident began with a 911 call to police from a homeless outreach worker just before 10 a.m. Thursday, Police Chief Greg Suhr said. About 20 seconds later, a dispatcher reported shots fired. "We have one down," an officer reported seconds later. "Officers are OK. We have the suspect holding the knife; he’s down. 408 code 3 [calling for an ambulance, emergency]. The scene is secure, and we’re going to need outside units to help us with the crime scene." The same officer reported about 25 seconds after the report of shots fired that an officer had fired less lethal impact rounds at the suspect "several times." "The suspect did not go down," he said. "He got up and charged at officers with the knife in hand." Visor is not the only alleged witness to the shooting who has disputed that Gongora charged officers with a knife. A man identified as "Smith Patrick" posted online shortly after the shooting that he saw "the whole thing," and recognized the suspect as a Spanish speaker who often kicked a ball on the street. Across the street I could see the victim cowering on the ground while two police officers, one with a rifle pointed at him, approached from at least 30 feet away. To be clear, the victim was on the ground the entire time, head down, visibly shaking. There was no visible aggressive behavior. I am unsure if the victim rose or if the rifle that shot him propelled his body, but he was standing for a moment while the rifle shot several times and the other officer drew a pistol and shot. Blood immediately started spurting but they continued to shoot. It appeared that several shots did hit him because blood was spurting in different directions. The victim was then on the ground in a pool of blood. Police and fire arrived within moments. They went through the motions of trying to revive him medically, but it was clear that he wouldn't live. So much blood. This is incredibly disturbing and I'd like to pursue filing a report against the police. If anyone knows any organizations that focus on this, please let me know. SFPD's first fatal officer-involved shooting of this year comes at a tense time for the Police Department, especially around lethal incidents involving Latino or black suspects allegedly armed with knives. A broad group of legal experts, police officers and advocates are rewriting the department's use-of-force policies following the Dec. 2 fatal shooting of Mario Woods in San Francisco's Bayview District. 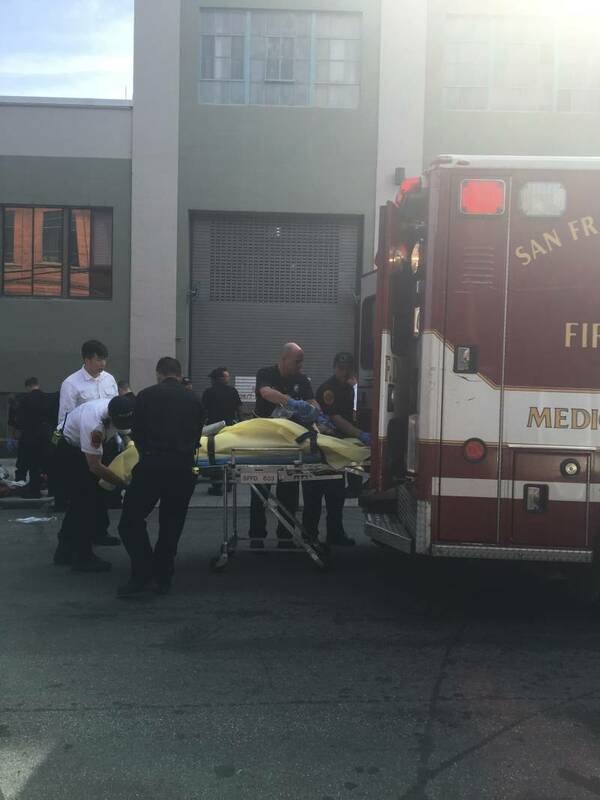 The shooting prompted immediate changes to the SFPD's firearms training, as well as a federal Department of Justice review. That incident, captured on multiple videos filmed by bystanders with cellphones, shows a large group of officers confronting Mario Woods, an African-American, before he appears to start walking away. An officer steps into his path, then multiple officers fire. Suhr initially said cellphone video showed Woods raising the knife toward an officer before he was shot. A KQED analysis of the video indicates that Woods' arm was raised after he was shot and begins to fall backward. Thursday's is the latest addition to a list of controversial fatal police shootings in or around the city's Mission District in the last two years. A federal, civil jury cleared four SFPD officers last month of any wrongdoing for shooting a total of 59 times at a man in Bernal Heights, just south of the Mission, in March 2014. The officers said they thought Alejandro Nieto had a firearm, and discovered he was holding a Taser stun gun only after the shooting. Another man who was a monolingual Spanish speaker was killed by two plainclothes SFPD officers in February 2015. Suhr initially said Amilcar Perez Lopez charged the officers with a knife, but revised that account after an independent autopsy showed Perez Lopez was shot six times from behind. Adam Grossberg of KQED News contributed to this report.